bouldrz a écrit : Hey thanks for the reply. I found it in the states. It's on his way as we speak! Looking forward to shoot some polaroids! Awesome! Have fun with your new film :] I love type 80,wish they never stopped making it. Actually it does have the fill flash button. I must have confused it for a actual off button because if it has enough light the flash wont fire. Oh YES! The Mio's Flash can be turned off just like the Instax 500AF. Also it takes any Instax Mini Film so its very readily available! Sujet : What made you happy today? I got ALOT of instant film for christmas this year! Welcome to English Polaroid Passion! Sujet : Fujifilm Instax 500AF!! To be naked in homepage of PP.com !!! Sujet : New again to Polaroid! 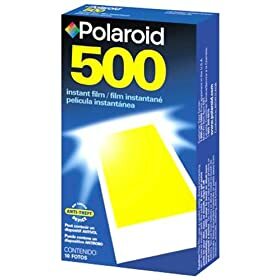 Do you mean Polaroid 500 film? Let them know that Instant Love is to be shared !!! Haha Right on! I will spread the word of this place.